Thailand bus fire kills 20 migrant workers from Myanmar. 18 were women. Who cares? Early Friday morning, March 30, in Tak Province, a bus carrying workers from Myanmar to a factory district caught fire. The bus was carrying 48 workers, plus the driver and his wife. 20 workers were killed, 18 women, 2 men. Once again, despite the overwhelming gender composition of this event, the international press described the dead as simply “migrant workers” and then proceeded to focus on Thailand’s hazardous roads and the shoddy condition of the bus. 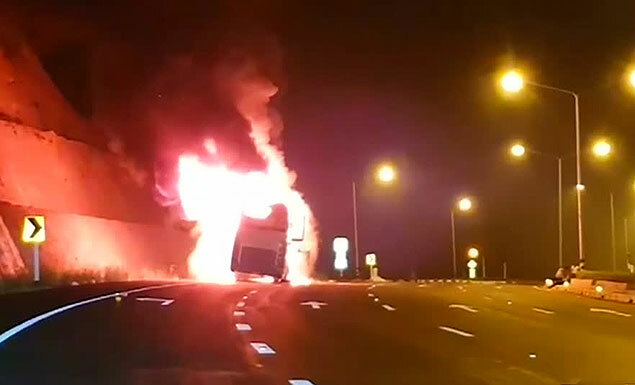 Thailand has dangerous roads, but this incident was a rolling factory fire. As in Tangerang, Indonesia; Triangle Shirtwaist Factory, United States; Kader Toy Factory, Thailand; Zhili Handicraft Factory, China; Tazreen Fashions Factory, Bangladesh; Kentex Manufacturing Corporation; Philippines; House Technologies Industries, Philippines; Bawana Industrial Area, India, and so many others, this bus fire was a planned massacre of women workers. And, as so often in these cases, the news media generally glosses over the massacre as an assault on women. What happened? A bus carrying 48 women workers, a bus driver and his wife, was on route from Myanmar to the Nava Nakorn Industrial Zone, near Bangkok. The bus was without air conditioning. Around 1:40, a fire broke out in the middle of the bus and spread quickly. Those in the front managed to escape. Those in the back were burnt to death. According to reports, the workers, from Myanmar, were all properly registered migrant workers. According to the Thai Labor Ministry, Thailand has about 2.7 million registered migrant workers, primarily from Myanmar and Cambodia. Women migrant workers figure prominently in the industrial and agricultural sector as well as among domestic workers. There is no surprise when, of 20 people killed in a factory fire, 18 are women. There is no surprise that the bus was in such bad shape it would have to be described as equipped to kill at least 20 people in the event of a fire or other catastrophe. There is no surprise here, none of this is new. It’s all part of the development model the entire world has signed on to. Apparently, the women workers in this particular bus were heading to work in a Japanese-owned toy factory. At what point do women matter to the world at large? At what point do the world media begin to consider the high numbers of women killed in the disasters built into our built landscapes, from the garbage dumps of Maputo, Mozambique, and Addis Ababa, Ethiopia, to the earthquake struck buildings of Mexico City, Mexico, to the factories across the globe? This past week, a bus in Thailand caught fire. 20 migrant workers from Myanmar were killed. 18 were women. Who cares?